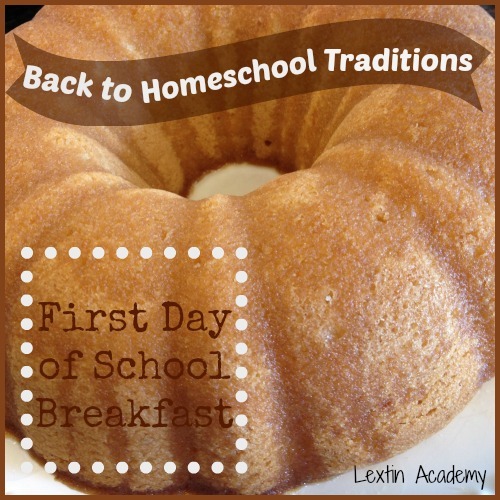 My kids love our back-to-homeschool breakfast tradition of eating a special treat for breakfast on the first day of school – usually it’s homemade cinnmon rolls, chocolate donuts, or some type of cake. And if Bee ever outgrows some of her many allergies, I’d love to add some coconut ice cream to our menu for our first day breakfast. This year the kids asked for a bundt cake, so I made an orange bundt with orange syrup. It was gone in 30 minutes and the kids were on a sugar high all morning – which was ok since we were headed to the pool.